Photo by Joan Marcus Here is part of the cast of the Broadway revival of Once On This Island. In the foreground, Alex Newell as the God Asaka and Hailey Kilgore as Ti Moune share a moment. Photo by Joan Marcus Quentin Earl Darrington appears as Agwe. Photo by Joan Marcus Cast members sing a joyful song. Yes, that really is a live goat on stage. 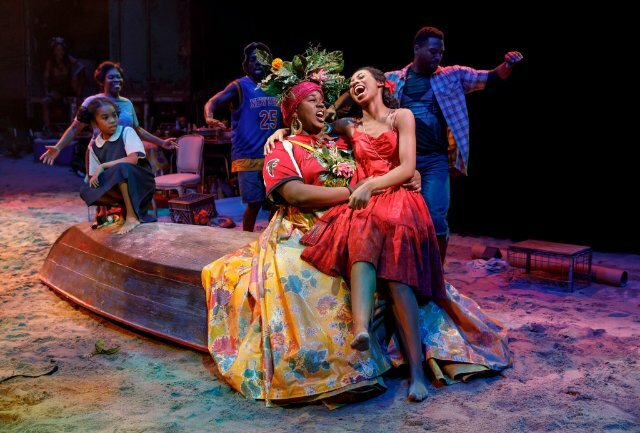 It’s leading its handler toward the audience in the astonishing, breathtaking, visually enthralling, vivacious, but most importantly, healing and life-affirming, current Tony-winning revival of the 1990 musical Once On This Island. In fact, the animal’s owner might encourage you to pet it. Or, the villager might invite you to sample some of his freshly-cooked food. Certainly, he’ll also welcome you warmly to his island in the French Antilles archipelago in the Caribbean Sea. Chances are, you hardly recognize it from your last visit — perhaps during the original 1990 Broadway production. It all takes place at Broadway’s Circle in the Square Theatre. Given what’s happening in today’s broken world, this tranquility seems as strange and foreign as the sites and sounds onstage. For instance, a cage of live chickens squawk, there’s a fire for cooking food, a real truck backs up and moves forward and the stage is essentially a sand-covered beach. One exception is a pool of water so deep one can fish in it. To be sure, there are several signs of devastation from a storm. But it’s nothing that can break these people’s indomitable spirits. In fact, scenic designer Dane Laffrey’s work, which includes hung-up clothes, extends beyond the stage. This might suggest we’re all part of this community of villagers. A “theater-in-the-round” configuration enhances that sense of solidarity and community. But those welcoming sites and sounds for such sore eyes clash with a climate of discord, division and disharmony. In scenes painfully familiar to today’s divisiveness, darkness and deadly detestation, nobles deride peasants as though the latter aren’t worthy to breath the same air. The well-off erect barriers that send a clear message: Integration is not welcome. Meanwhile, real, heavy sheets of rain, flooding, clasps of thunder and an unforgiving, howling wind reinforce a sense of coldness and isolation. However, the power of love is stronger than fear and destructive forces. That is what director Michael Arden, who doesn’t let the enthralling visuals get in the way of the heartfelt story, seems to be saying in this visceral, honestly emotional production. It features energetic dancing, ritual and a Caribbean-flavored, vibrant and varied Lynn Ahrens/Stephen Flaherty (Ragtime, Seussical) score. Cast members sing the songs sincerely and vivaciously. The cast joins a vibrant live band in playing the score. And the instruments aren’t at all what you might expect. One of this production’s themes, that leaves you with a positive feeling, is finding use in what some may consider “garbage.” And so, cast members use as musical instruments trash bins, flexible piping and other objects left over from the storm. This production isn’t likely to end anytime soon. Certainly, that’s a wonderful thing to hear. That’s true not just for musical theater lovers, but those desperately needing hope and faith in humanity. Watching a disheartening barrier come tumbling down is such a pleasure – as is taking in this entire first-rate revival. While one of its major themes is rebuilding, it’s not just about repairing structures. The show also focuses on building human relationships, forming ties that never existed. And so, supreme and earthly beings try to unite two classes of people in the story within the story. Speaking of tales, storytelling plays a large a part in the healing and rebuilding process. And so, this musical taps into the restorative power of the ancient tradition of relating narratives and enacting rituals. No doubt, watching this revival is like sitting around a campfire, the heat radiating toward you and warming you as you relax and let others regale you with tempting tales. Of course, such a scenario would surely prove a balm to the little girl frightened by sounds of a storm in the musical’s beginning. To sooth her, the villagers tell her a story. It’s about a young peasant girl, Ti Moune, who falls in love with a nobleman, Daniel. The Gods, whom the island’s peasants worship, had rescued Ti Moune from such a storm. The poor folks live on one side of the island. Meanwhile, the nobles — lighter-skinned descendants of the original French planters and their slaves — reside on the other side. But Ti Moune’s fierce love for Daniel is so intense, she’s literally willing to die for him. Nevertheless, the noblemen are equally adamant about not associating with whom they view as lesser beings. While Daniel has inherited stuck up ways, he’s open-minded enough to consider the strong-willed Ti-Moune’s feelings for him. As Isaac Powell embodies Daniel, we sense a soft, tender spot hidden beneath his haughty demeanor. Powell palpably and touchingly conveys sensitivity in his solo, “Some Girls.” Through Ahrens’ poetic lyrics, Daniel contrasts rich girls’ material possessions and desires with Ti Moune’s inner beauty and delicacy. Powell’s touching rendition of the song warms our hearts. Surely, they break when Daniel reverts to his previously arrogant ways. Likewise, the strong, stirring-voiced Hailey Kilgore makes us feel her character’s intense emotional heartbreak when Daniel leaves her with little to no feeling. It’s painful to watch. That’s especially true because Kilgore lends Ti Moune such intense emotion. Her dark eyes blaze with determination and desire. Also, her body language and voice communicate sincere desperation after her parents forbid Ti Moune from seeing Daniel. Surely, we root for her. Fortunately for this peasant girl, the huge-hearted gods with varying traits, resplendent in eye-appealing, yet character appropriate costumes designed by Clint Ramos, come to her rescue. On the contrary, the evil “God” Papa Ge (a sly, commanding and arrogant Rodrick Covington), makes a Faustian deal with Ti Moune. In a surprising development, even Papa Ge, redolent of death, performs a surprising act at the end. Might the power of love be so strong that it can change the ways of a seeming devil? Surely, it has to instill you with hope as you leave the theater. 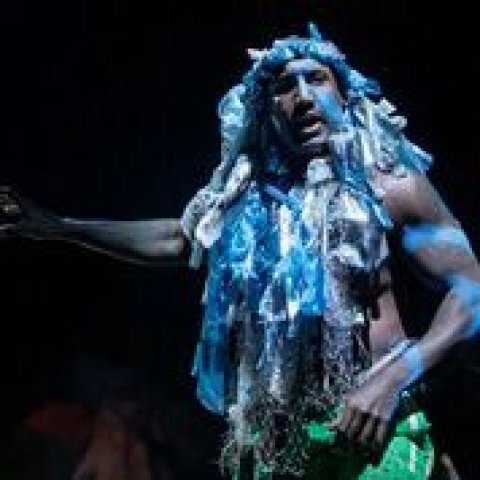 The Tony Award-winning revival of Once on This Island is on-stage at The Circle in the Square Theatre, 1633 Broadway (on 50thStreet) in New York. 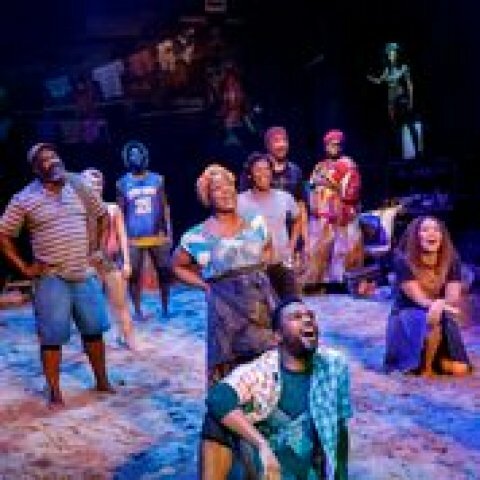 For tickets and more information, visit http://www.onceonthisland.com.